BT Global Services is a networked IT Services business that operates globally and delivers locally to help our customers succeed. We have a unique breadth of scope, reach and capability. We bring together communications and networked IT products and services securely and efficiently. We understand networks. We build and run them to deliver the applications critical to our customers success. We deliver with innovation and dedication. By managing their networked IT services, customers are freed to get on with making their business flourish. We have been operating in Asia Pacific since 1985. Today we employ 4,000 people across 20 offices. We serve more than 500 major customers in the region including: Air China, Anglo American, CLSA, Deutsche Post DHL, Haier, HCL, Hitachi, Microland, Nestle, PepsiCo, PernodRicard Asia, Proctor & Gamble, Serco, and Unilever. In 2010, we set an ambitious, three-year investment programme - to double the size of our business and to support the increasing number of global multinational organisations expanding into the region, as well as local multinationals going global. The US$78m investment included 300 new people, the setting up of six new customer technology showcases, and adding 20 new products and services to the portfolio. In 2013, we announced further investment in the region with 400 new jobs being created. As a result, our Asia Pacific business has grown over 20% year-on-year - more than double the market rate. In addition, new order signings have grown 85% year-on-year. BT has been serving customers in the Middle East and North Africa (MENA) for more than 30 years. In 2006, Dubai was established as our sales and technical support hub for MENA, a region stretching from Morocco at its western end to Pakistan in the east. In the Kingdom of Saudi Arabia, BT operates through BT Al Saudia, a joint venture with HRM Prince Dr.Abdulaziz bin Sattam bin Abdulaziz Al Saud and a key partner to BT's strategy in the region. BT supplies a core set of networked IT services such as managed global IP services, unified communications and convergence services, managed security and risk resilience services, managed CRM platforms, sector-specific professional services, and outsourcing to multinational organisations and international institutions. BT MENA currently employs over 100 ICT professionals serving more than 300 major customers in the MENA market. In the region, BT has been successful in proactively supporting the development of its major multinational customers and in helping the fast-growing regional airlines industry expanding globally. BT is committed to enabling the region's telecoms operators achieve their competitive and expansion objectives. As such, BT provides services to transform their organisations into agile customer-focused companies. In 2008 EBTIC, BT's Innovation Centre in the region in collaboration with Etisalat and Khalifa University was launched. 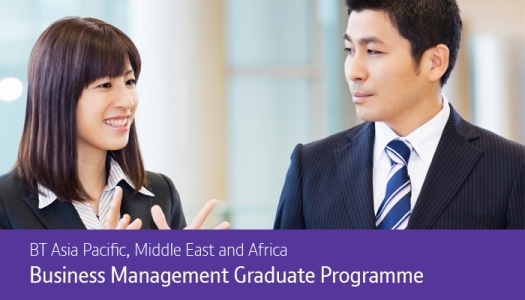 Find out more and apply now at BT Global Graduate Programme!